Discussion in 'Feature Requests (AdGuard for Windows)' started by deleted, Dec 25, 2014. 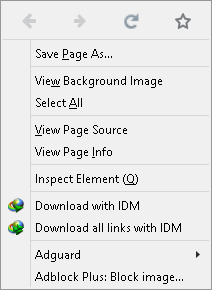 Have not seen this feature in any of the adblockers except ABP. Thought it would be nice to have it in adguard as well. The ability to block images on the go/from context menu. Images can be anything from logo to backgrounds to icons and the like. what this will do is it will prevent loading of certain images and hence making faster page loading. just an e.g softexia contains a blue background, which loads later than the default white background. Good idea, thank you! Added to our browser extension roadmap. Not possible. Only would work with the browser extensions. A while back I installed the extension and it was nice to see this feature now being a part.